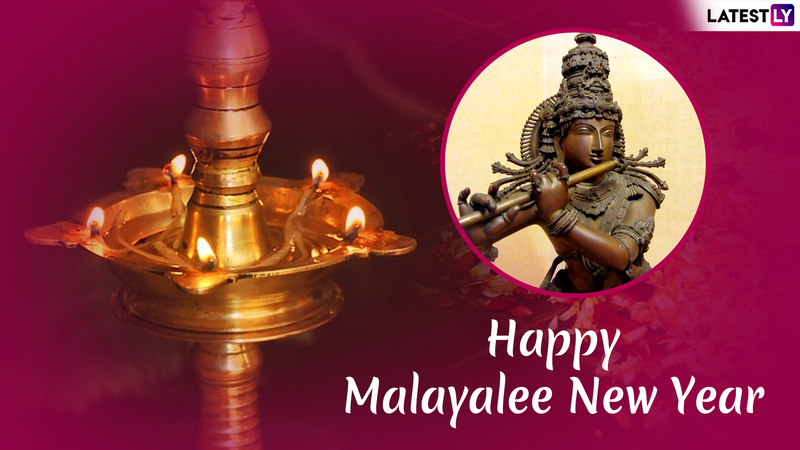 After wishing Puthandu Vazthukal to our Tamilian friends on Tamil New Year (April 14), it’s time to wish Vishu Ashamsakal to our Malayali (Keralite) peers as they celebrate Kerala New Year on April 15. The month of April witnessed numerous New Year’s Day celebrated as per the Hindu or sidereal Hindu calendars. People residing in the Indian state of Kerala and coastal Kanyakumari will celebrated Vishu 2019 (Malayalam: Viṣu, Tulu: Bisu Parba) on Monday. People greet each other by saying “Vishu Ashamsakal” meaning “Vishu wishes.” We bring you images with ‘Vishu Ashamsakal’, ‘Happy Malayalam New Year’, ‘Happy Kerala New Year’, and ‘Happy Malayali New Year’ written on it. 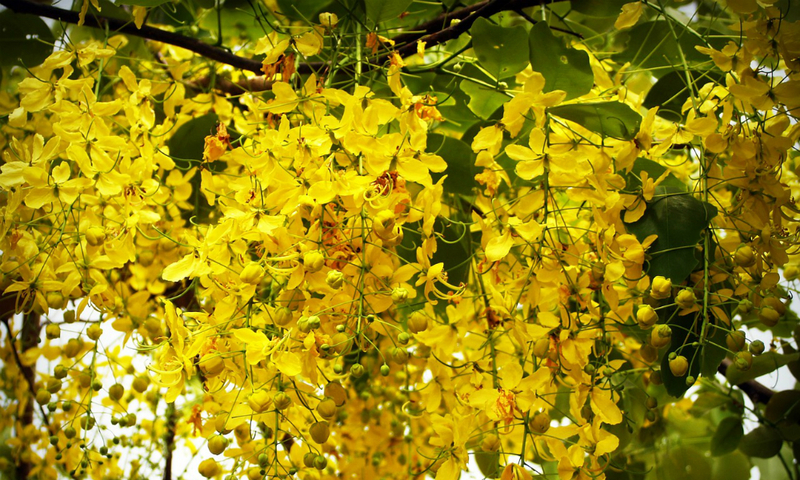 Along with Vishu Ashamsakal images, there are beautiful images and HD wallpapers of Vishu flowers i.e. 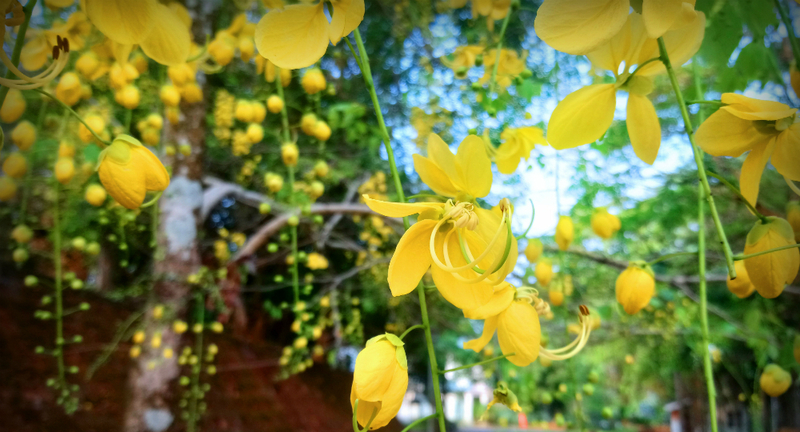 Cassia fistula or Indian laburnum (Kani Konna) with Vishu 2019 wishes, Vishu greetings, Vishu messages in Malayalam, Vishu wishes in English, Vishu 2019 WhatsApp Stickers, Vishu 2019 GIF greetings, and more. Happy Vishu 2019 Messages in Malayalam: Whatsapp Stickers, Greetings, GIF Images, Quotes & SMS to Send Kerala New Year Wishes. Vishu falls on the first month of the Malayalam calendar (Kollam Era) Chingham. The word “Vishu” translates to “equal” and it epitomises the completion of the spring equinox. In fact, the Kerala New Year falls on the day of vernal equinox, i.e., the day when the sun is considered to move from the northern to the southern hemisphere. Speaking of Vishu celebrations, it is slightly different from other New Year’s Day festivities. There are no pompous celebrations but chooses to observe it with great solemnity and exuberance. Vishu is the time of the year when family members bond over the preparation of Vishu Kani (prepared by arranging items around Vishnu form, preferrably Krishna idol), collect Indian laburnum (Kani Konna), money or silver items (Vishukkaineetam) for viewing, and gorge over Vishu Sadhya. You can learn more about Vishu 2019 Date & Vishu Kani Time and the Story and Significance of Vishu Sankranti here. 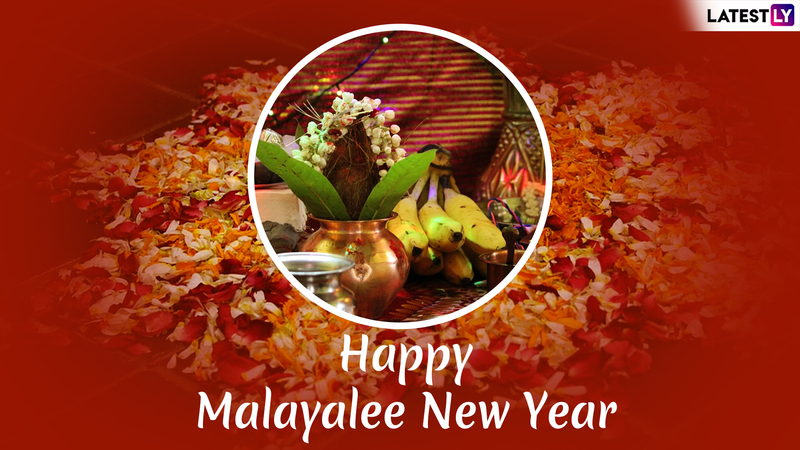 Coming back to Vishu Ashamsakal images and wishes, search engines are flooded with request for latest messages and greetings to send on Kerala New Year. Both Keralites and non-Keralites search for beautiful Vishu Ashamsakal wishes and messages, because most of us have friends and colleagues celebrating the special day. Vishu 2019: How to Prepare Vishu Kani, From Krishna Idol to Grains, the List of Items To Include. 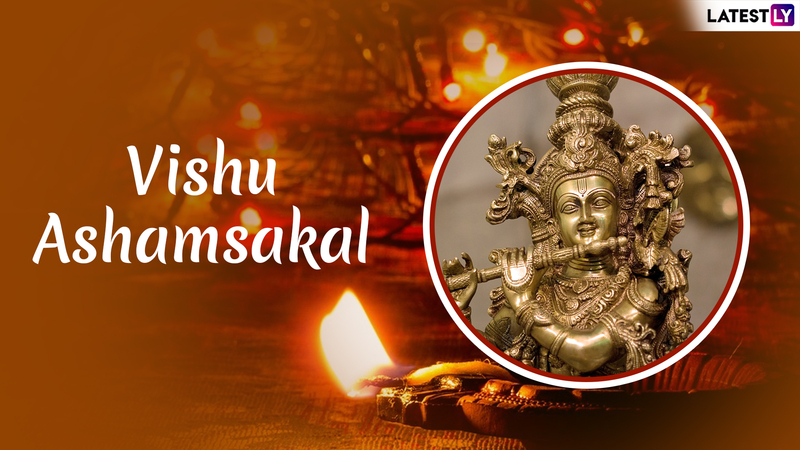 Some of the most-searched keywords related to Vishu 2019 are - Vishu Ashamsakal, Vishu 2019, Vishu Ashamsakal images, Vishu Kani, Vishu Ashamsakal 2019, Vishu images, Vishu Ashamsakal Malayalam, Vishu greetings, Vishu Ashamsakal 2019 Malayalam, Vishu wishes, Vishu Ashamsakal images 2019, Vishu wishes images, Vishu Ashamsakal images Malayalam, Vishu festival, Vishu Ashamsakal photo, Vishu Ashamsakal quotes, Vishu Ashamsakal wishes, Kerala New Year wishes, Kerala New Year festival, Kerala New Year images, Malayalam Vishu wishes, Malayalam Vishu wishes in English, Malayalam Vishu wishes for wife, Malayalam Vishu free, Malayalam Vishu wishes to download, Malayalam New Year wishes, Vishu Malayalam New Year wishes, Malayali New Year, Malayalee New Year, and more. Vishu 2019 Recipes: From Sambar to Palpayasam, How to Make a Kerala Sadhya Feast from Scratch This Malayali New Year. WhatsApp Message Reads: Get Together on This Auspicious Day, Lord and His Blessings Coming Your Way, Have a Happy Vishu, With Loved Ones Near, May You Be Successful All Through the Year. Wish You All a Happy Malayalam Vishu Ashamsakal 2019. WhatsApp Message Reads: Pularkkaalathinte Nairmalyavum Puthuvarshathinte, Pratheekshakalumaay Veendumoru Vishukkaalam…Ellavarkkum Puthu Pratheekshayude, Vishu Aashamsakal. WhatsApp Message Reads: Let This Year Be a Golden One for You, Forget the Past and Invite the Future, Wishing You a Happy Vishu Ashamsakal! WhatsApp Message Reads: A Great Beginning, an Auspicious Day, May This Vishu Bring Happiness Your Way. Have a Great Vishu Ashamsakal! WhatsApp Message Reads: Manasil Ennum Kanikkonna Viriyatte…Jeevithathil Ennum Aiswaryam Nirayatte…Orayiram Vishu Asamsakal. WhatsApp Message Reads: In the Spirit of This Glorious Festival of Vishu. I Wish You and Your Family the Best of Life and a Wonderful Vishu Celebration. Have an Awesome Time Today. Have a Great Vishu Ashamsakal! WhatsApp Message Reads: Peace, Patience, Devotion and Prayer, May You Be Blessed With Lords Care, Successes Be Many and Failures Be Few, There Are My Vishu Wishes for You. Happy Vishu. Have a Great Vishu Ashamsakal! WhatsApp Message Reads: Celebration Time Is Here Again, Devotion, Prayers, Songs and Food, May Vishu Bless Every Household, May It Brighten Up Everyone's Mood. Happy Vishu. 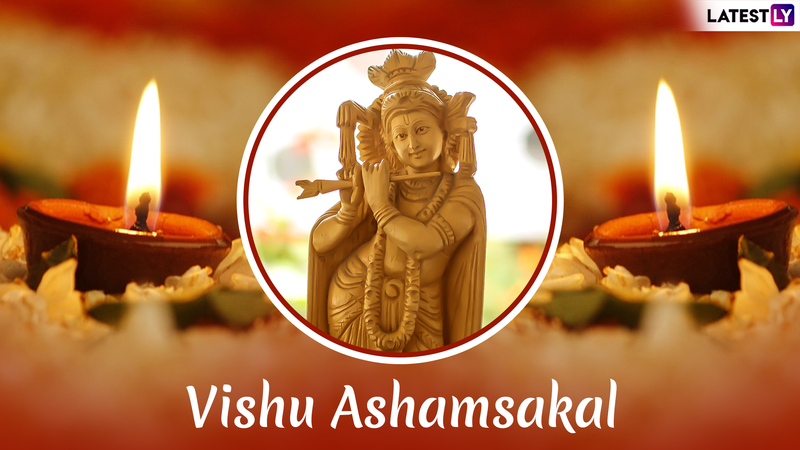 Have a Great Vishu Ashamsakal! How to Download Vishu Ashamsakal 2019 WhatsApp Stickers? You can download Vishu 2019 WhatsApp Stickers easily on Play Store. There are numerous apps such as "Vishu stickers for WhatsApp," "Vishu Messages And SMS", "Happy Vishu Greetings Messages and Images", "Happy Vishu Photo Frames" and more. You can download them all HERE. Just like Vishu is celebrated in Kerala, the festival of Bisu marks the Solar New Year Day for Tulunadu region of Karnataka, that includes, Mangalore, Udupi, Kasargod. The festival is commonly called “Bisu Parba” in Tulu Language. We hope as you see the Vishukani, you let your heart and soul invite the future with new zeal and forget all bitterness of the past. May the Lord’s blessing bring peace to your home and heart on Vishu and always. Happy Vishu to all of you! 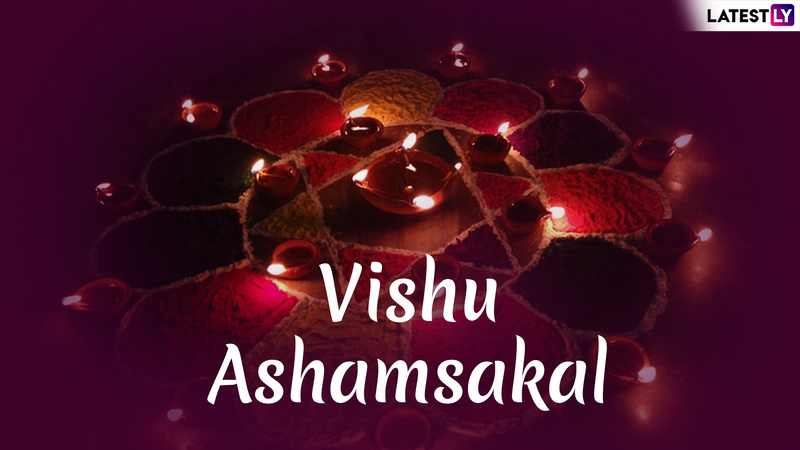 Have a Great Vishu Ashamsakal!